Solicitor Ben Lees considers the legal and ethical ramifications of paying GPs to reduce outpatient referrals, and how this fits within the government’s wider plan to slash £22bn from NHS funding. An exclusive article in Pulse Magazine (a specialist publication for General Practitioners) has revealed that GP practices are being offered thousands of pounds to refer fewer patients for specialist care. For example, NHS North-East Lincolnshire Clinical Commissioning Group (CCG) is offering payments that would equate to more than £6k for the average practice to reduce outpatient referrals to the same level as the 25% of practices with the lowest referral rates, including two-week urgent cancer referrals, in 2014/15. According to Pulse Magazine, up to 9 CCGs are involved in schemes such the above. Quite correctly, the schemes are under scrutiny for creating a conflict of interest in the consulting room. Do GPs check whether they are within target before they make an oncology referral? If so, how will this information weigh in the decision to make an urgent referral for a potential cancer patient? Dr Robert Morley, Chair of the General Practitioners Committee, regarded the incentivising of GPs to reduce cancer referrals as ‘extremely concerning’ and elaborated that the schemes may be ‘ethically questionable’ and ‘in conflict with GMC Guidance’. It is no coincidence that these schemes have emerged at a time when the health service is preparing to implement £22bn of ‘efficiency’ savings. But what is the human cost of slashing NHS funding? To what extent is the government willing to sacrifice patient safety in the name of deficit reduction? What does this mean for cancer patients? As a clinical negligence lawyer, I have seen first hand the devastating impact an unnecessarily late diagnosis of cancer can have on patients and their families. Lives have been cut short needlessly; children have grown up without a parent, or parents without their child. 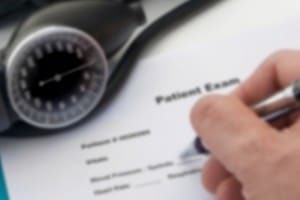 Over the last decade researchers have been making inroads in the fight against cancer, but retrograde steps such as schemes which encourage GPs to consider financial implications before referring cancer patients is a huge leap in the wrong direction with the potential risk of a later diagnosis. I am particularly concerned about delayed diagnosis of cancer because, at the same time as these schemes are being rolled out, the government is proposing fixed fees in clinical negligence claims (as another cost saving exercise) which my colleague Bhavesh has written about recently. The proposals will mean that fees for pursuing clinical negligence claims, such as those which relate to late/delayed diagnosis of cancer, will be fixed with reference to the level of damages awarded, with no consideration of the complexity of the case, or the cost of investigating it. In other words, lawyers will be able to take on cases where damages are extremely high because they will be able to cover their costs. Lawyers will also be able to take on cases where damages are low but extremely simple and inexpensive to investigate (again because lawyers will be able to cover their costs). However, lawyers will not be able to take on cases where damages are low, but complex and expensive to investigate. The reason for this is that these cases cost vastly more to investigate and fight than the fixed fee which would be allowed. You would not expect a manufacturer to make tables at a cost of £20 but sell them for £10, and you cannot expect lawyers to lose money on every case until they go out of business either. Many delayed diagnosis of cancer claims (particularly those where the patient dies) will fall into the category of cases that lawyers will frequently no longer be able to take on. They are notoriously difficult and costly to fight because the medical and legal issues are extremely complex, but levels of compensation can be low. Schemes such as the above are just the latest in a long line of ‘efficiency savings’ which will see junior doctors working longer hours when they are exhausted and more prone to human error, nurses being cut from neonatal wards, mental health services being sidelined, and walk in centers closing up and down the country. The Government will say that they are reducing bureaucracy and waste, but this is simply not the case. It is not wasteful to have well rested doctors, enough nurses to safely deliver and look after newborn babies, or GPs who are not financially incentivised to stop cancer patients from receiving specialist care before it is too late. Fixing fees for lawyers who are fighting for the rights of patients is not the answer either. It is not acceptable to increase the risk of harm with one hand, and deny patients and their families access to justice when they are harmed with the other. Most commentators will agree that the deficit needs to be dealt with, but where the hammer falls is a matter of choice. The government is choosing to take £22bn from a health service that is already overstretched, and in so doing, are putting lives at risk. Perhaps it is time to stop compromising lives for the benefit of the deficit and start compromising the deficit to save lives.